Discussion in 'Star Style' started by beatgobum, Apr 15, 2009. Andrew was born in Los Angeles, California, the son of a British mother from Essex and an American father from California. His family moved to England three years after he was born.Garfield is Jewish and was raised in a "middle class home".Garfield's parents ran a small interior design business; his father later worked as a swimming teacher and his mother as a teaching assistant at a nursery school. He was raised in Surrey, England and attended the City of London Freemen's School in Ashtead before training at the Central School of Speech and Drama. Winning the Best Actor Award at the Bafta's 2008 awards. I think he's an amazing actor. If you don´t know him, check out his performaces in Boy A and in Lions For Lambs(with Robert Redford). If anyone is interested in watching any of these two films online let me know and i´ll provide the links. For future projects, he was casted in Never Let Me Go(which starts filming this april in London) alongside Keira Knightley, Sally Hawkins and Charlotte Rampling. Making your American screen debut in a film that co-stars Tom Cruise, Meryl Streep and Robert Redford is certainly one way to get noticed. "I'm just lucky to be there working on the same project as them, although I don't really expect to be recognized later by audiences," says Andrew Garfield, who stars in the Redford-helmed "Lions for Lambs," a pic that examines what it means for a country to be at war, and why certain individuals choose to fight. But recognition -- at least from Blighty theater critics -- hasn't been a problem for the Los Angeles-born Garfield. He was raised outside London, where he's spent most of his career. The thesp was named outstanding newcomer at the 2006 Evening Standard Theater Awards for his West End stage work, and this year shared the London Theater Critics' Circle Most Promising Newcomer Award with fellow thesp Connie Fisher. "I've been really lucky," a modest Garfield explains. "Something artistic can just as easily go bad as it can go good, and I've been fortunate to work with great people in the theater." The actor admires Redford's career path and would like to stay on a similar course. "I sort of have his voice in my head about how not to get seduced by money, status or superficial things," says Garfield. "I don't really want to do 'American Pie 7,' and I see Bob as someone who was the heartthrob of his generation, moved away from the place where people wanted to pigeonhole him and made interesting choices." As his career picks up momentum -- he'll co-star with Scarlett Johansson and Natalie Portman in "The Other Boleyn Girl" as well as British indie "Boy A" -- Garfield says he wants to avoid the kind of fame-seeking behavior taken in by some other young actors and focus on the work as the reward. "All I've ever aimed for is just to be allowed to express myself," says Garfield "And that people seem to enjoy seeing me do my work is more than I could hope for. I don't take it lightly." AN ACTOR SHOULD ALWAYS: "Stay true to your instincts. Hang in there and stick it out and find out if you have (what it takes) to do this job." I'M INSPIRED BY: "Being able to affect someone the way other great actors have affected me." FAVORITE FILM CHARACTER: "Tom Cruise's character in 'Magnolia' was brilliant. I also love everything Dustin Hoffman has done. He was amazing in 'Lenny,' 'Kramer vs. Kramer' and 'Midnight Cowboy.'" recent pics from march 25th. A fantastic young actor Boy A is just heartwrenching. A well deserved Bafta award too. ^yes we do. Good thing they all hang out together sometimes...what a great combo! Adrian Chiles, Christine Bleakley, Rob Brydon, Gary Lineker, Adrian Lester, Patsy Kensit, Andrew Marr, Kirsty Wark, Jools Holland, Sarah Alexander, Andrew Garfield, Robert Webb, Kate Silverton, John Torode, Gregg Wallace, Louis Theroux, Richard Armitage, Hermione Norris, Michael McIntrye, Tess Daly, Idris Elba, Michelle Ryan, Ed Westwick, Davina McCall, Lindsay Duncan and James Nesbitt. the bafta's are on sunday 26th, btw. oh Gosh, thanks for those!!!!!! do you know who his gilrfriend is? and I spotted Effy and Cassie (don't remeber their real names) on the 2nd pic, cool! ^his girlfriend is shannon woodward, she´s an actress. There were some pics of her with rpattz last year hangging out in LA and it was her birthday party that he mentioned at his GQ interview about going later that day, the one where katy perry was also pictured. When he got the part in Boy A, he was, he says, "terrified". He worried that he wouldn't be "good or interesting or unique. That's always a genuine feeling that I have. And it's tough trying to figure out whether you need to feel that way to be creative. Do you have to make yourself a wreck?" Neither of us know the answer to this, but another cigarette might help for now. "I hadn't had much camera experience. I didn't know any tricks," he continues. "But if you trust an audience I think they get drawn in." In Boy A, Jack falls in love for the first time. The performance is terrifying in its naivety. "I had been in love twice at that point and I just went inside myself because that's what the audience sees," he says. Is that how he is when he's in love, I ask, all pure and raw? "Yes, I am. Warts and all. Open heart. And that was the struggle with Jack. He knew he couldn't be himself and that's why he couldn't live. He knew the world wouldn't allow it. And I think that's a metaphor: if you suppress things you never get away with it." 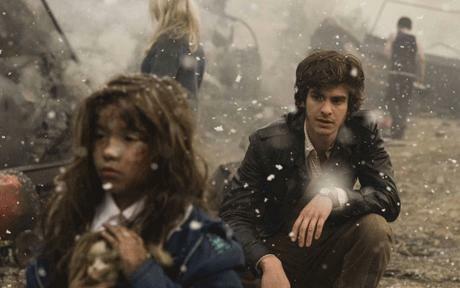 Andrew Garfield was born in America but his family moved to the UK when he was just a child. He trained at Central School of Speech and Drama in London and graduated in 2004. Andrew is part of the cast of The Imaginarium of Dr. Parnassus with legendary director Terry Gilliam, in which he appears alongside Heath Ledger (following his untimely death, it has been reported that he will be replaced by Johnny Depp), Christopher Plummer and Tom Waits. His film debut was in 2007 playing opposite Robert Redford (co-starring with Meryl Streep and Tom Cruise) in Redford's Lions for Lambs. He went straight on to shoot Boy A, directed by John Crowley. Carson Reeves has heard that not only has David Fincher begun casting on the big screen adaptation of The Social Network, but that the cast might already be set. Rumor has it that Jesse Eisenberg has signed to play Facebook founder Mark Zuckerberg (how perfect is that casting? ), Andrew Garfield is set to play Facebook co-founder Eduardo Saverin, and Justin Timberlake will play internet entrepreneur Sean Parker (Napster). If true, this is shaping up to be a very solid cast, but what else would you expect from a Fincher production? I don’t normally like Timberlake, but anyone who knows the story for the film or has read the book will know he’s the perfect person to play Parker. 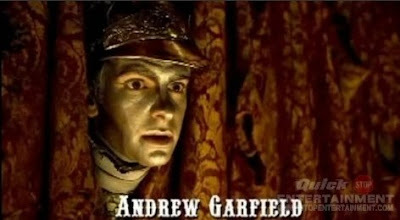 Garfield broke onto the scene with a Award-winning performance in Boy A, and has since appeared in Lions for Lambs, The Other Boleyn Girl, and The Imaginarium of Doctor Parnassus. Last month we learned that Columbia Pictures had given the film an official greenlight, a rumored $47 million budget, and that production will begin in October with scouts actively searching for film locations in Cambridge and Boston. Eduardo Saverin and Mark Zuckerberg were Harvard undergraduates and best friends–outsiders at a school filled with polished prep-school grads and long-time legacies. They shared both academic brilliance in math and a geeky awkwardness with women. Eduardo figured their ticket to social acceptance–and sexual success–was getting invited to join one of the university’s Final Clubs, a constellation of elite societies that had groomed generations of the most powerful men in the world and ranked on top of the inflexible hierarchy at Harvard. Mark, with less of an interest in what the campus alpha males thought of him, happened to be a computer genius of the first order. Which he used to find a more direct route to social stardom: one lonely night, Mark hacked into the university’s computer system, creating a ratable database of all the female students on campus–and subsequently crashing the university’s servers and nearly getting himself kicked out of school. In that moment, in his Harvard dorm room, the framework for Facebook was born. What followed–a real-life adventure filled with slick venture capitalists, stunning women, and six-foot-five-inch identical-twin Olympic rowers–makes for one of the most entertaining and compelling books of the year. Before long, Eduardo’s and Mark’s different ideas about Facebook created in their relationship faint cracks, which soon spiraled into out-and-out warfare. The collegiate exuberance that marked their collaboration fell prey to the adult world of lawyers and money. The great irony is that while Facebook succeeded by bringing people together, its very success tore two best friends apart. The Accidental Billionaires is a compulsively readable story of innocence lost–and of the unusual creation of a company that has revolutionized the way hundreds of millions of people relate to one another. He has the thickest hair I've ever seen on a man. I love him! I first saw him in Sugar Rush and since then has proven himself to be quite the talent. I think he should be doing better things than the Spiderman reboot, though. Maybe it might be good for him? ^Is it confirmed he'll be doing that? Yeah, there was a press confernce and everything.